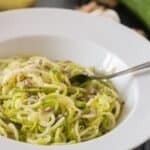 Garlicky zoodles with sunflower seeds recipe – Vegan garlicky zoodles topped with sunflower seeds and light herbaceous dressing. When it comes to lunch time like most people I like to keep my food choices simple yet tasty. I remember working on an industrial estate and come lunch time there was no where to eat. Well I’m exaggerating a little, more like I didn’t appreciate the vendor and food stands on the estate. Part of my disdain for these unappetising food stands actually encouraged me to bring my own lunch with me to work. I mean why shouldn’t I be fully prepared for the working day, I cooked all the time at home, yet I didn’t equip myself with lunch? Charla how foolish were you! Yes I was idle, not foolish at times BUT it also inspired me to be even more health conscious as I didn’t want to succumb to junk food which would give me that terrible crash and burn and not to mention bloating so I made my own from scratch. 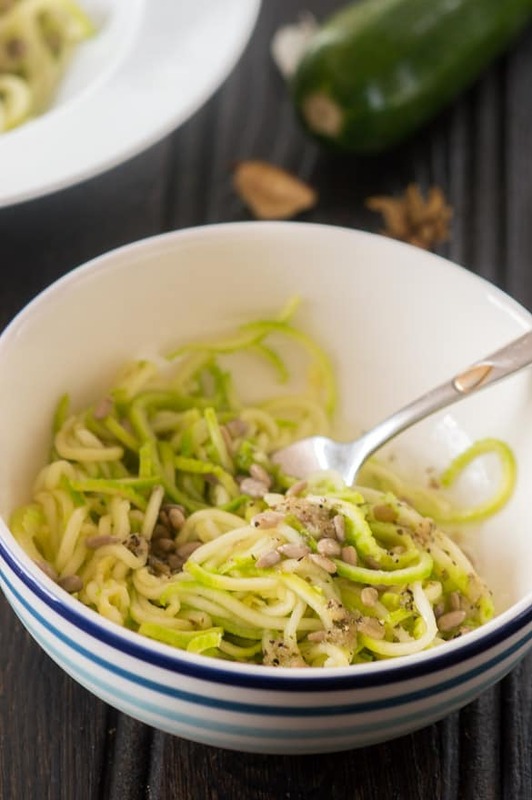 One of my favourite lunch time meals to carry with me was this simple garlicky zoodles with sunflower seeds and topped with a subtle dressing. It’s light on the tummy, nothing to dense/heavy and keeps the body content for a few hours. 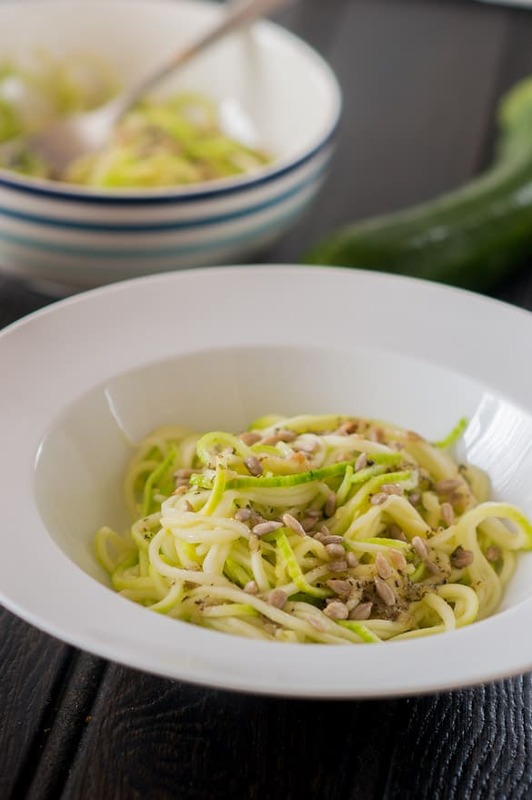 There is a healthy balance of water soluble carbohydrate, that being the courgette (zucchini as the US know it as) along with protein and fats from the sunflower seeds. This salad yields an even balance of macro nutrients for sustainability throughout the day. It’s also an ideal salad to consume if you’re looking for something that is filling but won’t cause any unwanted weight gain or bloatedness. As previously mentioned I like to bring this to work with me, it’s easy to pack in a lunch bag and simply drizzle on the dressing prior to serving. ** This post contain affiliate links, a small potion of commission goes to the maintenance of That Girl Cooks Healthy. 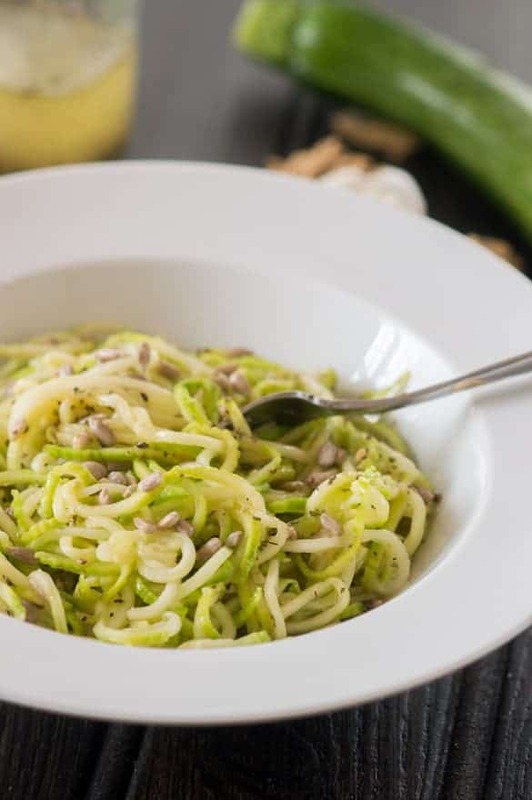 Start by sprinkling the pink salt over the entire zoodles to coat and leave to stand for 5 minutes. During the given time the zoodles will secrete any bitter liquid. Transfer the zoodles into a small saucepan on medium heat with the warm water. Steam for 5 minutes until tender and drain off any excess water. 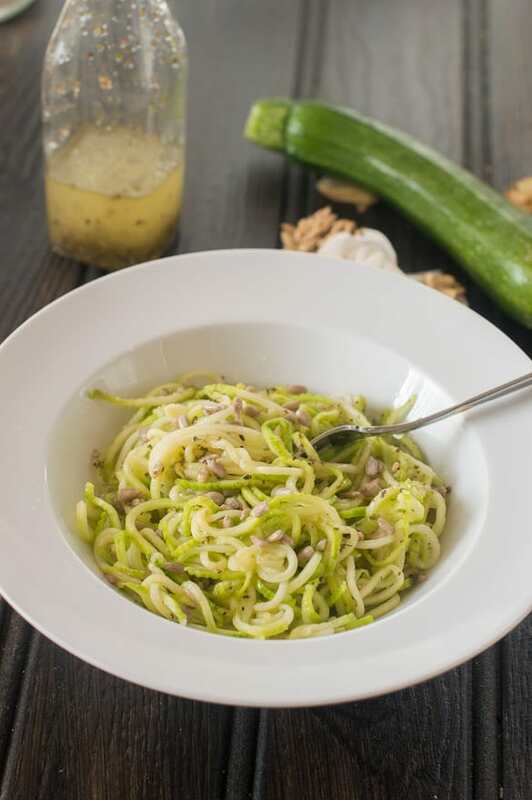 Sprinkle the sunflower seeds on top of the zoodles and drizzle with the garlicky dressing. Oooo, this looks like a lunch for all your coworkers to be jealous of! I keep meaning to jump on the zoodle train because it sound like such a good alternative to pasta. And I love that this is served with a light dressing rather than sauce so it won’t weigh you down at lunch time! Thanks Tracey. Yes, if you do give this recipe a try you will be the envy of all. I mean it’s low fat and tasty (courtesy of the dressing) what’s not to love? I really like working with zoodles. Makes for a much healthier meal. Your dish sure looks healthy with good color. Thank you. 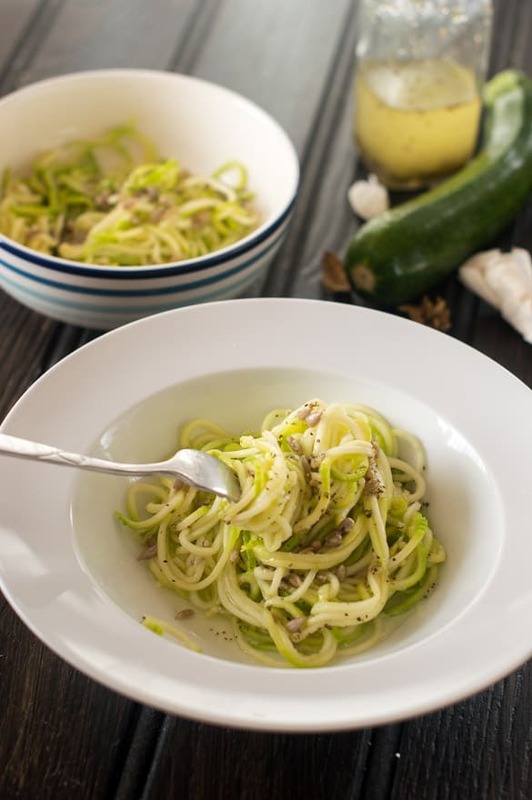 Yes zoodles are so much healthier to work with and tasty depending on what you pair them with. Lunch at work should be simple and easy. Portable is a must! I pack my lunch and find myself in a rut – most days I pack the same things to eat. It’s simplicity. This salad would liven up my lunch! Noel, I know exactly what you mean. I used to be one dimensional with my lunch. I think becoming a foodie has inspired me to venture outside of the box. Thanks for commenting Diana. Yes they are also known as zoodles. Lemon sounds like a really good idea, must try that.